These recent elevated radiation readings have caused me some concern to the possible source. I greatly appreciate your suggestions as to the possible source. Once I noticed the elevated levels, I started looking at the NRC Reactor Status reports to see if there was any nuclear plant refueling or accidents nearby me, but I was unable to find anything. Below is a graph of my last two month 1-hour average chart. If anyone wants a more detailed report/graph of my data or other stations graphs, please subscribe for access to that. It is only $19.95 per year and that financial support covers server, programmer & bandwidth costs. As I research more for the source of my elevated reading, the California wildfires are an obvious source. The fires will transfer the Fukushima fallout from place to place through the smoke. My last station filter change was on the 15th of July so my levels right now are slightly lower than what they would normally be with a good filter. Today the electric company came out to service my meter. As a result, my service was disconnected for a short period of time and is reflected clearly in my graph. I'm 8 days late replacing my outside radiation monitoring stations HEPA filter, but I'm showing elevated readings. I believe this is due to all the fall burning that is being done, fall clean-up. My normal daytime range is between 15 & 32 CPM but with the burning around the area it has been elevated and I'm going to wait for it to go down before I replace it with a new HEPA filter. Q: After a refueling outage, how long does used fuel have to stay under water before being put in a dry casket storage container? A: It can vary depending on many different factors. I didn't push the subject because it embarrasses my wife and our kids were with us. Today at 1 p.m. CST I replaced my outside radiation monitoring station HEPA filter. 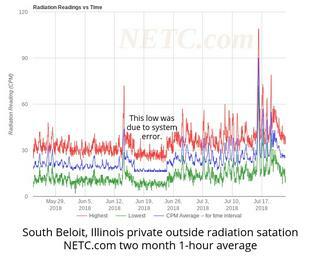 Some elevated readings will be noticed because with all the fall burning that is being done around my area, it's likely to see radiation being relocated through the smoke. Today December 4, 2018 at 9:20 a.m. CST I replaced my outside radiation monitoring station HEPA filter. Due to the increased airflow, slight elevated readings can be expected when compared to the readings from the 30 day old filter. It is interesting to note that I try to replace my outside radiation monitoring station filter every 30 days. Sometimes I am late by a few days or even sometimes a week. When I have a filter on that has nearly reached its 30 days of use or more, the air flow is reduced through it and therefore the readings tend to be lower as a result. Every time I replace my filter, I make record of it within this thread. Look at the recent elevated radiation level detected on this old filter. If a new filter had been in then, the reading would likely have been near a 100 cpm. As long as the readings on my station only go up in the evening and down in the early morning, during the day and stay below 100 cpm, I do not get too concerned. Radiation comes down with the upper atmosphere overnight, often attached to dust, smoke, rain, snow, dew.